There is nothing like a day about love and romance to ignite your passion for fashion. The Love in Fashion’s event at Tootsie’s on Tuesday, February 4, 2014 introduces fashion knockouts for both you and your honey. This event offers a glimpse into some of the hottest fashions for both men and women. By showcasing the fashions with philanthropist couple serving as your models attendees have a fantastic opportunity to get insight into designs that may be great for you on Valentine’s Day. To make the event even sweeter there is a change to check out the hot designs you may want to see on your Valentine. Tootsie’s is always unparalleled as a treasure trove of unique clothes from the hottest designers and this event is sure to inspire your fashions for a hot date night. What is almost more delicious than the fashions at the Love in Fashion’s Event is the purpose. The runway provides some inspiration for design and insight into the impact the charity, Dec My Room, provides for youth in the Houston area. The charity provides beauty and motivation to children and young adults in hospitals. Hospitals can be a very depressing place and Dec My Room personalizes the hospital room for children with prolonged hotel visits to help breathe some new life and pleasure into a difficult situation. The stories of the children this charity works for are amazing and is proof positive that changing your environment can also change your perspective and look forward to more great things ahead. 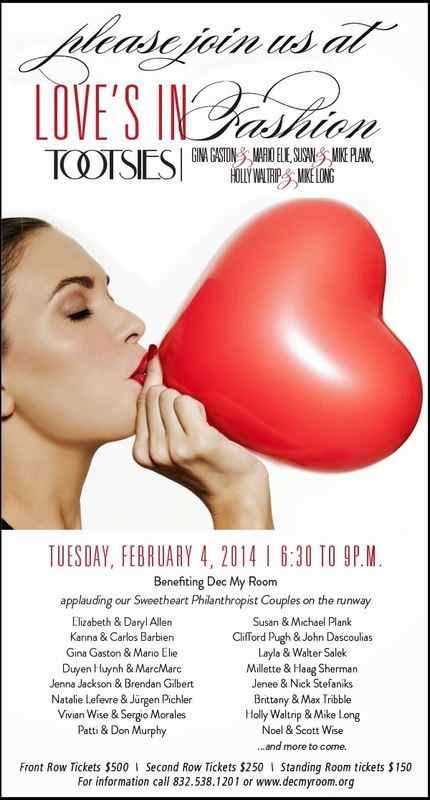 Party with a purpose at the Love in Fashion event and walk away ready to turn heads on Valentine’s Day.